Democratic Rep. Ilhan Omar released a statement Sunday night explaining what she’s experienced since President Trump tweeted a video of moments from 9/11 with her words “some people did something” in between. “Since the President’s tweet Friday evening, I have experienced an increase in direct threats on my life—many directly referencing or replying to the President’s video,” she said. "I thank the Capitol Police, the FBI, the House Sergeant at Arms, and the Speaker of the House for their attention to these threats." “Violent crimes and other acts of hate by right-wing extremists and white nationalists are on the ride in this country and around the world,” she said. “We can no longer ignore that they are being encouraged by the occupant of the highest office in the land." She continued: "Counties that hosted a 2016 Trump rally saw a 226 percent increase in hate crimes in the months following the rally. And assaults increase when cities host Trump rallies. This is particularly concerning given the president’s visit to my home state of Minnesota on Monday. 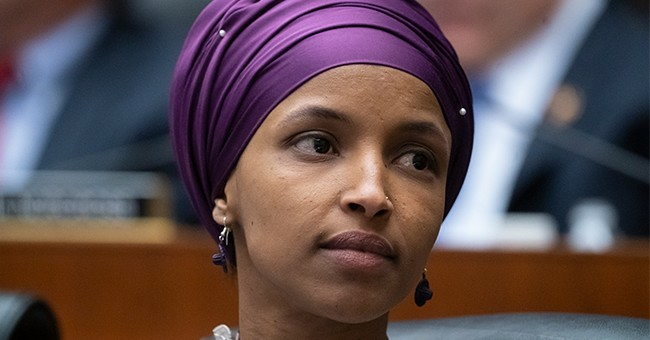 The portion of Omar’s remarks used in the video came from a speech she recently gave to the Council on American-Islamic Relations. She stated that CAIR was formed after 9/11 "because they recognized that some people did something and that all of us were starting to lose access to our civil liberties." In reality, however, CAIR was established in 1994. White House Press Secretary Sarah Huckabee Sanders defended the video the president tweeted and said he would continue calling out the freshman Democrat. "Certainly the president is wishing no ill will and certainly not violence towards anyone, but the president is absolutely and should be calling out the congresswoman for her not only one time but history of anti-Semitic comments," Sanders said. "The bigger question is, why aren’t Democrats doing the same thing? It’s absolutely abhorrent the comments that she continues to make and has made and they look the other way."